Saves a SHA256 hash of the incoming user user-agent to a configurable attribute on the users profile. A simple authentication node that stores a SHA256 hash of the requesting user-agent to the users profile. 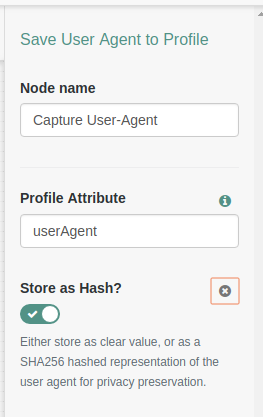 Deploy the node, and select which attribute you want to use to store the user agent (making sure this is available in the profile schema).